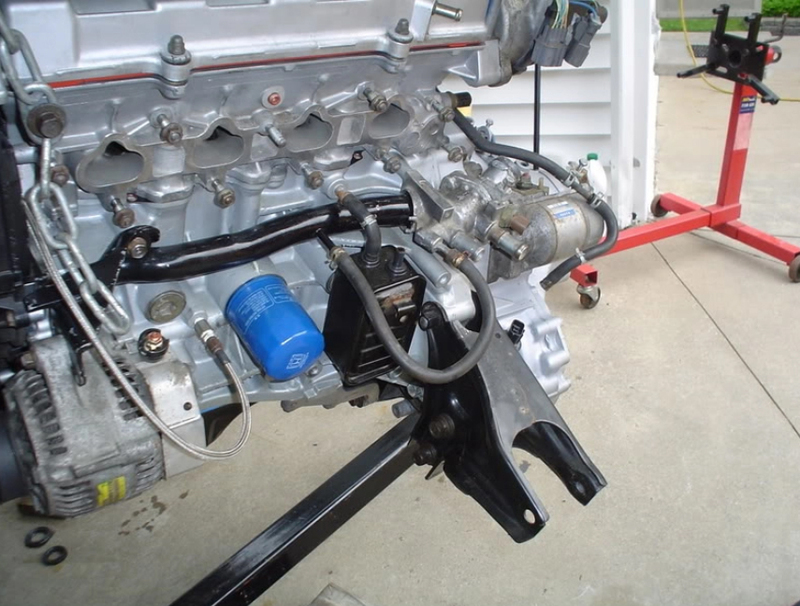 Team Integra Forums - Team Integra > Generation Specific > Generation Three > Get engine low enough, to get direct view of timing belt tensioner? Get engine low enough, to get direct view of timing belt tensioner? I rounded off the tensioner bolt, and would like to drill it out. Removing the 2 left engine mounts, near the cruise control actuator and crankshaft pulley, was not enough. I was thinking of placing another jack (with block of wood) under the transmission, and remove the mounts, and disconnect the catalytic converter. Would this be enough? I'm also not sure where the 5th engine mount is located at. I found 2 on the transmission side; one of them had 17mm nuts, and was difficult to remove due to rust..
2001 Integra GS Automatic Coupe; B18B1: 230,000 miles. Last edited by k3ntegra; 03-31-2019 at 03:55 AM. I think you have two options there of varying difficulty. you could drop the engine/trans (not fully but just enough to get at that bolt) OR You can do it the way I'm planning to do to mine and take a small hole saw and cut a relief in the frame rail flange where that bolt is and weld it shut for future access. The Latter of the options only pays out if you are planning to keep the car long enough to eventually do another belt/tensioner/etc. Thanks for responding. I came across this post (link), thanks to google images. It seems to be object #11 & #8 of this diagram. Another link similar to the 1st. I'm leaning towards the 1st solution you mentioned. The green circle in this 1st image is where I was planning to use a hole saw. There's supposedly another engine mount supposedly around the intake manifolds. I was planning to placing a scissor with a block of wood under the transmission. I just want to make sure that the exhaust manifole (j-pipe) is all that would need to be disconnected from the cat, to lower the engine, without damaging anything else. Last edited by k3ntegra; 03-31-2019 at 03:11 PM. yeah, one thing that you could look into if the exhaust studs are rusted shut like 90% of the cars here in Minnesota is just unhook the exhaust hangers and see if that gives enough so the exhaust can be left on. The 5th engine mount is located at the back of the engine, close to the firewall. It's a pain to get to, you need a long line of extensions for it. I did the same thing when I changed mine several years ago. I ended up grinding the head off the bolt with a cutoff wheel. Funny part was that once I did that I was able to back the bolt out with my fingers (gloved of course). I presume because of the heat and lack of tension on it after I removed the pulley. It seems the battery life of the DeWalt 20V drill, isn't long lasting compared to the impact wrenches. I'll consider drilling the head off entirely, then pulling the tensioner off, and hoping vise grips will be strong enough to turn it. Last edited by k3ntegra; 04-01-2019 at 08:13 PM. Didn't read the whole thread, so forgive me if I repeat the information. You may want to use a Dremel tool and simply make a cut across, right through the center of the bolt head. Then take plyers and squeeze both head halves together. You should then be able to remove the tensioner bolt with your fingers. Goodluck! Last edited by Built_not_bought; 04-02-2019 at 01:23 PM. Here is a pic of the bracket connected to the engine, thank to this thread. It seems the twin bolts at the bottom, connect to the transmission. The acutal engine mount bolts facing down, may not need to be disconnected. If one may point me to a diagram displaying the back part of the engine block, it would be appreciate. Last edited by k3ntegra; 04-03-2019 at 06:36 PM. Why not have just used some vise grips? Or dremel a couple flats for a better bite? Removing all those mounts seems like a lot of extra work. Otherwise I'd go with grinding off the head of the bolt as mentioned prior. Vise grips were no good in my case. I'd like to also advise other from using a drill to remove the bolt; small m7 bits just ended up snapping, and the big ones getting dull. Hopefully angle grinder will do the trick. 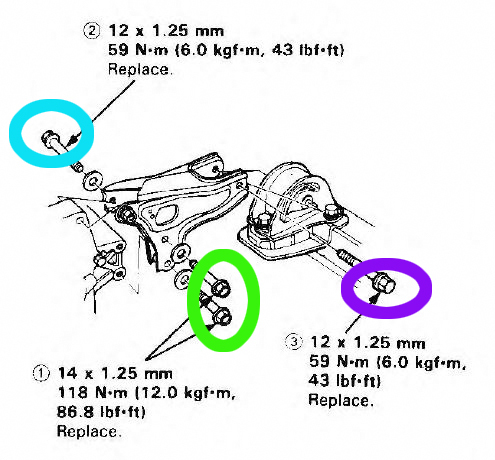 With the exhaust manifold removed, I was able to remove the green and purple bolts (latter slightly loosened to make it pivot) pictured below, from under the vehicle. For the blue bolt, I had to remove air-intake hose. Also had to dismount the radiator(?) hose at the front of the engine, and disconnect fuel filter hose, to prevent them from getting damaged while lowering engine. The passenger side mounts both need to be loosened, in order to bring the engine low enough to get a direct line of sight of the tensioner bolt. I was able to use a 20v battery powered grinder to take off the head of the bolt in under 5 minutes, then use my hand and un-thread it. I was able to also use 'cheap' HSS M2(?) left-handed drill bits to remove that AC compress tensioner bolt that has tendency to snap off. Last edited by k3ntegra; 04-09-2019 at 07:23 AM.